From here you will find the straight solution for after Double click on folder and application can’t open, forward music in iTunes not working correctly. We use Magic Mouse or Magic Trackpad on iMac, Mac Mini and Built-in Trackpad on MacBook laptop (Double click on trackpad mac not working). 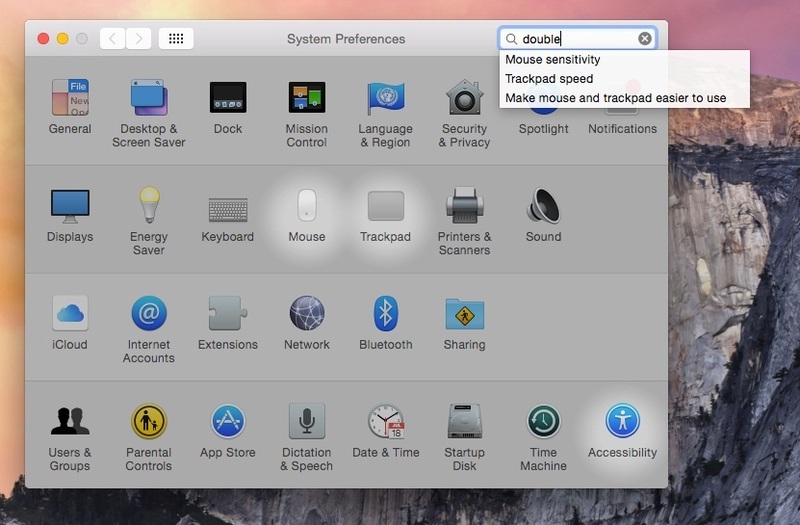 Most of the Mac and Windows users always keep mouse arrow moment/ Speed and Double Click or Single click to be set at maximum speed. In this case, you made the wrong set of your system. One of them is occurring in this case. Double click is not working on folder and file for open it, So you have to do right click on it and tap on Open option. I also face this problem many times, but it has been automatically resolved when updating OS X or downgrade OS. 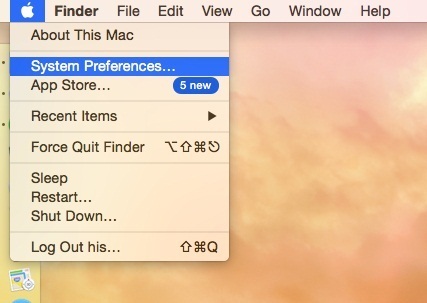 So don’t be panic here is the complete solution for fix double click not working after OS X update. But without Update, OS X here is the solved solution. Useful: Get Convert currency and Exchange rate using Spotlight on Mac. This solution is working on MacOS High Sierra, MacOS Sierra, EI Capitan, OS X Yosemite, Mavericks, and Lion. Quick Soln: Slow Down Mouse click speed. Follow the steps below. Step 1: From the top Apple Menu click on it. Step 4: Navigation option will hover over Accessibility settings. 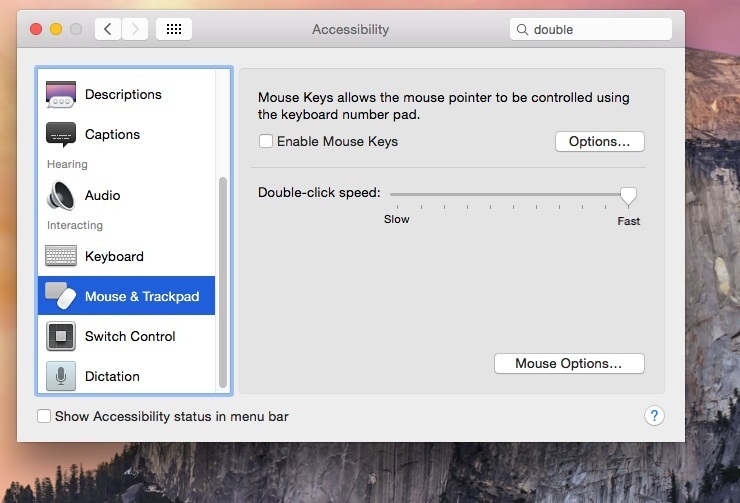 Step 5: Click on it and Scroll down for “Mouse & TrackPad” option. Step 6: “Double click mouse speed” slider moved to slower down position. Don’t close Accessibility setting folder try out by open any folder with the double click on it? 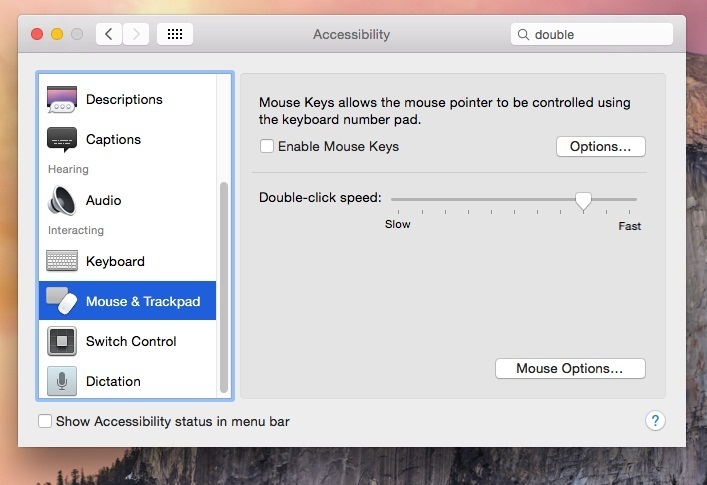 In a single path you have to move System preference > Accessibility > Mouse & TrackPad > Double click. For Slow down Double click on the folder. Get More Help: Trackpad Not Working on Mac. Also useful: Optimise/ improve battery life of MacBook Pro and Air. The sound is good right! That’s enough for short Double click on folder not working when you try on MacBook Air, MacBook Pro, MacBook Pro Retina, iMac Pro, iMac with the trackpad or External USB mouse.